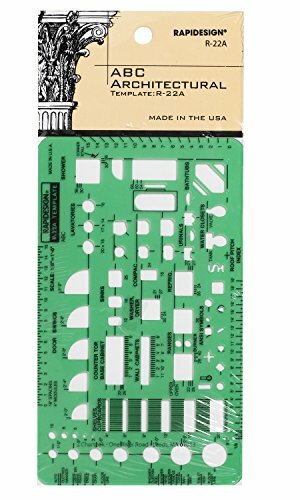 Rapidesign ABC Architectural Template (#R22A) has 1/8 inch = 1' scale. For architects, builders and contractors, this template contains the symbols most commonly used in the profession. Includes roof pitch gauge and 16" spacing in 4" modules. Made in USA. Rapidesign has the world's largest selection of drafting templates for architects, builders, engineers and graphic designers. Includes roof pitch gauge and 16" spacing in 4" modules.